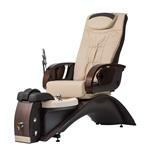 While the industry is moving away from piped pedicure units and more towards water oscillation, many other upgraded features and finish selections are available to truly customize your unit, from solid surface tops and bowls, finish selections, retractable footrests and recline features. Make sure to consider your plumbing and electrical requirements with each new unit. The Manicure industry has always been a social event and the industries top designers around the globe are creating ergonomic and functional equipment with sleek clean designs be a talking point for all your clientele. Current legislation in some states is requiring ventilation coding to be followed so please speak with local city officials for clarification.